Kentucky chose to keep the kickoff away from South Carolina star Deebo Samuel and the Gamecocks started the first drive of the game at their 32-yard line. One play later, QB Jake Bentley found Deebo Samuel over the middle and Samuel for an eventual 68 yard touchdown, sending the 82,493 in attendance into a frenzy and BBN into near cardiac arrest. South Carolina would miss the extra point leaving the score 6-0, USC. Just 0:35 seconds later, QB Stephen Johnson threw an interception to the South Carolina defense. UK’s defense stood firm and stopped the Gamecocks on four downs, leaving USC to try a 54 yd. field goal that would miss wide right. Offensive Coordinator Eddie Gran dialed up the Wildcat with Lynn Bowden in at QB. 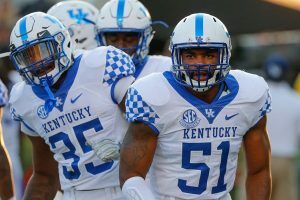 A high snap led to UK’s second turnover of the game, giving the Gamecocks the ball on the Kentucky 38 yd. line. The teams then traded turnovers when UK’s Mike Edwards intercepted a Jake Bentley pass on the 14-yard line. Kentucky’s defense didn’t let the first play of the game rattle them. Coach Stoops said, “We take a shot right on the chin to start the game, the place is going wild and we embraced it.” Credit goes to the defense for stepping up in this game. Coach Stoops done a great job at managing the game and simplified the defense all while confusing the Gamecocks. UK’s biggest defensive stat of the game was that they held USC to 3 of 12 on 3rd downs, coming up big and getting the ball back 9 times. UK also held USC scoreless 6 times in UK territory. Coach Gran and the offensive unit dialed up plays that allowed Kentucky to sustain drives. Drives that would eventually end in points and points are what win games. Once the Wildcat was run consistently, it worked, something I didn’t think I would ever say. Stephen Johnson managed the game and the clock to perfection and once UK righted their ship, they never looked back the entire game winning 23-13. This was a different team than we saw the previous two weeks. This was a team that showed poise in the face of adversity on the road, and stepped up big on defense. And a team that managed to move the ball with a diversity of plays that kept USC guessing the entire game. Benny Snell led the Cats in rushing with his second straight 100+ rushing yard game (32-102; 2 TDs). QB Stephen Johnson went 16-25-1 for 169 passing yards while also gaining 86 yards rushing for the game. 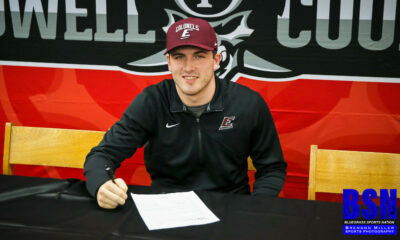 Kicker Austin MacGinnis was a perfect 3-3. On the defensive side of the ball, Derrick Baity led the way with 8 tackles and an interception. Mike Edwards also had a great game with 7 tackles and an interception. With Jordan Jones out for the week and some questions on the defensive side of the ball, UK stepped up and played the best game of the year. Kentucky is now 3-0 for the first time since 2010. Next Saturday, UK (3-0; 1-0) welcomes the Florida Gators (1-1; 1-0) to Kroger Field for a 7:30 p.m. kickoff. Florida comes in off of a last second hail-mary victory over the Tennessee Volunteers in the Swamp. The win moved Kentucky to a 10-4 record over the last 14 games, including the fourth road win in that stretch (also last season at Missouri and Louisville, this year at Southern Mississippi). Including last season, this is UK’s third-straight road win, first time that has happened since winning at Auburn, Vanderbilt and Georgia in 2009. This is the first time UK has defeated an SEC opponent in four-straight seasons since defeating Vanderbilt four in a row in 2004-07. 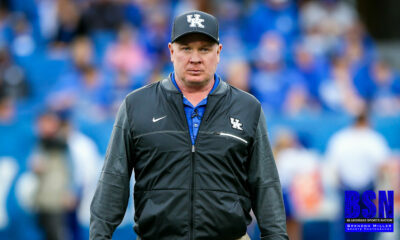 UK is 18-1 under Coach Mark Stoops when leading after three quarters. UK limited South Carolina to 13 points. It has been nine years since the Wildcats held three straight opponents to 17 points or less, the first five games of the 2008 season. South Carolina had 54 rushing yards. UK has held all three opponents this season under 100 rushing yards. It has been nine years since the Wildcats held three straight opponents under 100 rushing yards, the first three games of the 2008 season. The Kentucky defense made two huge stops on fourth down in the second half. On 4th-and-1 from the UK 49, Derrick Baity and Courtney Love tackled USC for no gain. That set up a drive for a field goal. On 4th-and-1 from the UK 1, Baity and Jamar “Boogie” Watson tackled USC for no gain. Kentucky converted 9-of-16 on third-down conversions, including five in a row in the two touchdown drives in the first half. With the help of the third-down conversions, UK dominated time of possession, 36:49 to 23:11. Stephen Johnson completed 16 of 25 passes for 169 yards. UK is now 10-4 over the last 14 games with Johnson as the starter (8-4) or QB for the majority of the game in a relief role (2-0). Benny Snell led the rushing attack with 32 carries for 102 yards and two touchdowns. Benny Snell topped the 100-yard mark for the second-consecutive game and seventh of his career. Snell is the first Wildcat to have two rushing TDs in the first half of an SEC road game since Anthony White at LSU in 1998. Snell is the first Wildcat to have two rushing TDs in an SEC opener since Curtis Pulley vs. Florida in 2006. Snell is the first Wildcat to have two rushing TDs in an SEC road opener since Al Baker at Ole Miss in 1990. He has 1,363 career rushing yards, advancing four spots to 24th place on the career rushing list. Garrett Johnson caught four passes for 41 yards. Mike Edwards picked off a deflected pass in the first quarter, his second interception of the season and sixth of his career. Derrick Baity nabbed an interception on South Carolina’s final offensive series. He also was part of both tackles on the two fourth-down stops. He led the Wildcats with eight tackles. Austin MacGinnis made a 27-yard field goal in the third quarter and also made 44- and 21-yard field goals in the fourth quarter. He also hit both of his extra-point tries.